(April 14, 2014) Sherman Oaks, CA - Emerging film composer Matthew Llewellyn (Dead Souls, additional music for John Dies At The End, Far Cry 3) crafts a rich, thematic orchestral score for the Chiller Network original feature film, DEEP IN THE DARKNESS, opening in select theaters April 29 and airing on Chiller TV May 23. Llewellyn's traditional orchestral score for DEEP IN THE DARKNESS was recorded with the Slovakia National Symphony Orchestra and the soundtrack will be released digitally by MovieScore Media to coincide with the film's theatrical relase on April 29, followed by a CD release on Kronos Records simultaneous with the Chiller TV broadcast in May. 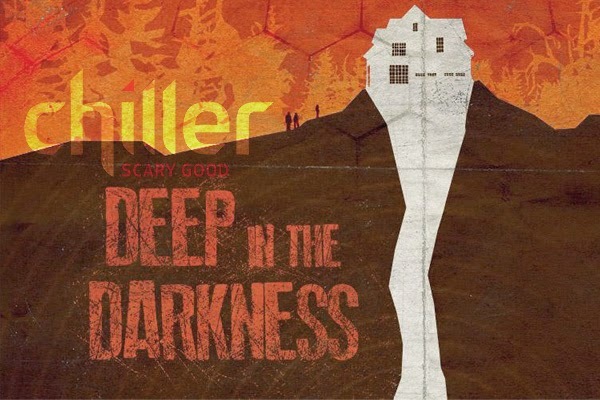 DEEP IN THE DARKNESS marks Matthew Llewellyn's third feature for Chiller, a division of NBC Universal, following his critically acclaimed score for the 2012 feature DEAD SOULS - "one of the most impressive genre scores we've heard" (Screamworks Records). His sweeping, ominous score evokes classic drama and horror scores, combined with Llewellyn's contemporary yet traditional orchestral textures. Based on the best-selling novel by Michael Laimo, DEEP IN THE DARKNESS stars Sean Patrick Thomas (The Fountain) and Dean Stockwell (Quantum Leap) and is produced by Andrew Gernhard and Zach O'Brien for Synthetic Cinema International (Dead Souls, Remains). The film is written by John Doolan and directed by Colin Theys. "Deep in the Darkness is a movie driven by atmosphere and a pervasive sense of looming evil," explains director Colin Theys. "Matthew Llewellyn's score is, as always, an absolutely integral part of the mood and tone of the film. The sound palette at once delivers the feeling of a classic, grand orchestral score and a modern, eerie horror film. It paints the portrait of a beautiful, idyllic New England town where evil lurks just out of sight." Dr. Michael Cayle thought leaving the chaotic lifestyle of New York City behind for the quiet, small town of Ashborough would bring his family closer together. Soon after arriving, however, he discovers the town's deepest secret: a terrifying -- and controlling -- race of creatures that live amongst the darkness in the woods behind his home. "Llewellyn found a delicate balance that feels original and intense at the same time, taking the film through some dramatic twists and turns," adds Theys. "Matthew is delivering world-class scores that elevate the films they help to drive." Preview music samples from the DEEP IN THE DARKNESS score: https://soundcloud.com/matthewllewellyn. See DEEP IN THE DARKNESS in New York theatres April 29, Los Angeles theaters April 30 and on Chiller May 23. For more information visit www.chillertv.com.